The opening leaf of Cambridge MA: Houghton Library, MS. Richardson 23, with the arms of Borso d’Este. My second report from my new location involves a manuscript that is hardly unknown but which I could not resist making one of the first I studied. It is a copy of four texts by the Milanese humanist Pier Candido Decembrio, made under his guidance for presentation to the duke of Ferrara, Borso d’Este, in the early 1460s. Decembrio, cheer-leader for his city in its opposition to all things Florentine, has been an acquaintance of mine since my graduate days, for, in the late 1430s and early 1440s, he attempted to construct for himself an international reputation by presenting works and sending books to Humfrey, duke of Gloucester, as I discussed in my doctoral thesis. So, when I opened up this manuscript and saw before me Decembrio’s script writing the contents list, it had the sensation of a meeting with a familiar friend. The humanist himself is not, however, the main scribe of this manuscript. As with some of those he made for Humfrey, he called on others to produce the volume but left enough evidence in the volume to show that oversaw its creation. As I explain in my description, his interventions here are multiple, correcting the whole text and adding annotations in some, using different inks for each level of accretion, suggesting he went over the manuscript two or three times. It provides us, then, with interesting detail about the mechanics of presentation — the desire to achieve an elegance which spoke of the cost involved being balanced by a need to personalise, not just in terms of the identity of the recipient but of the author as well. 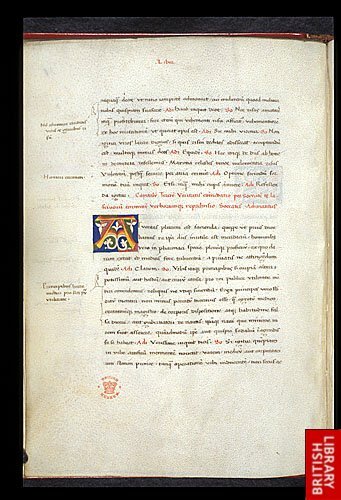 Textually, this manuscript of importance for being the earliest known copy of his panegyric of his home city, De laudibus urbis Mediolanensis (a work first composed in the later 1430s but, apart from this codex, extant only in two later fifteenth-century manuscripts, in Milan and Brussels). That is a work which demonstrated his patriotism for Milan and his repudiation of Florence’s claims to pre-eminence, for in this panegyric he engages with the Laudatio Florentinae Urbis of Leonardo Bruni, a work which had already gained an international circulation, turning on its head its claims by a process of quotation and revision which, at times, comes close to creative plagiarism. His expression of independence from Florence was expressed not only in words but in presentation on the page. He knew and acknowledged the reforms of the page promoted by Bruni’s friend, Poggio Bracciolini, but he by no means adopted it fully. In particular, he preferred a much smaller script than was fashionable in Florentine littera antiqua, and an example of this is on display not only in his own interventions but in the main script, which provides a notably compact block of text on the page. At the same time, Decembrio’s scribe here (identified as Gabriel Brepia) is more willing to accept some of the reforms than his commissioner. A key orthographical shift in Florence was the re-introduction of the digraph, demonstrating the presence of the diphthong (usually ‘ae’, sometimes ‘oe’). Here we see a contrast between Decembrio who continues to ignore it and his scribe who adopts a couple of strategies for marking the diphthong (a subscript mark, and a small loop before e). One wonders how far Decembrio condoned the transformation of his text in this detail, and whether he felt his work was succumbing to Florentine influence, even when it expressed its opposition to that city. Cambridge MA: Houghton Library, MS. Richardson 23, fol. 12v – with Decembrio’s rubrication annotation at bottom left. Contrast his lack of digraph with the scribe’s writing of ‘quae’ at ll. 8 and 13. The Houghton has helpfully digitised the whole manuscript and the iiif images can be viewed in Mirador. All I can add is a description of this important codex (with all the usual caveats about its draft status). Who needs Treasure when you have the everyday? My local library has opened an exhibition celebrating itself. Considering that that library is one of the largest in Britain and surely the most iconic university library in the world, no one could blame the Bodleian for doing that. Some might complain that the event is a tad unoriginal — the title, Treasures of the Bodleian, is also that of a volume from some twenty years ago. But, the answer could come, this has an elegant and interactive website, which includes a section looking forward to the opening of the New New Bodleian (Oxford’s answer to the game of Mornington Crescent, there) with an on-line ballot — albeit merely first-past-the-post — for what should be on display. And there’s even a write-in section for the ballot: ‘The People’s Choice’ it is called, which must be a sort of self-aggrandizing synecdoche, where the cultured bourgeoisie count as all ‘people’. With my research interests, I was curious to see what the curators had decided was a ‘treasure’ and, in particular, what late medieval manuscripts they had on show. The answer is very few and nothing at all to do with the University Library’s second founder, Humfrey, duke of Gloucester. And that’s even in the section called ‘A Bodleian Treasure’ with items, like Hilliard’s miniature of Thomas Bodley, providing visual vignettes of the library’s history. It is true that because of the early-sixteenth-century decline of the University Library and its eventual closure around 1549 — not all the fault of Richard Cox, despite what the commentary to the exhibition says — none of duke Humfrey’s manuscripts remained in the room now named after him, but some have returned. And if I was to propose a write-in campaign it would probably be for what is now MS. Duke Humfrey d. 1, a fairly small but refined manuscript of Pliny the Younger, with the duke’s ex libris and written in the hand of the Milanese humanist, Pier Candido Decembrio, who was then seeking the distant duke’s patronage. It encapsulates very well a particular element of Humfrey’s collecting and the international network that lay behind it. And, yet, when thinking what makes for me the Bodleian such a remarkable place — my local haven for scholarship — I realised that much of what is redolent to me is immovable or intangible. They could hardly take down the original donors’ plaque for the south staircase to put on exhibition; and they certainly could not move the view from the Arts End of the original Library across Bodley’s Quad. Even more of a challenge would be to capture and to bottle the sensation when the light rakes across Duke Humfrey’s on an autumn morning; the yellowish tinge to the lighting in the north range of the Upper Reading Room is little imitated; and the echo of the dome of the Upper Camera — admittedly not as sonorous as that in Manchester’s Central Library — could hardly be on display. Then there are the little things which make the Bodleian, for me, what it is: the snakes of beads used to hold down manuscript leaves (held in a box called the snake pit); the curve of the back of the chairs in the old reading rooms; the out-dated clocks, often now most often stopped, that stand guard over the corner of the reading areas. It is these comforts of the quotidian that make the Bodleian a home to scholars — and that is surely something to be treasured. Nobody, not even the rain, has such small hands, said e.e. cummings. He could have said such manicules, since in its Latin root, maniculae, the word means precisely ‘small hands’ — the diminutive of manus. It has come to mean something more specific to those of us who grub around in the margins of books: it is the nota-symbol drawn, sometimes rapidly, sometimes elegantly, as a pointing hand, a fashion that lasted several hundred years. Bill Sherman has discussed manicules with customary verve and insight; he has helped us consider their possible meanings. Except they do not, officially, have an English name; the manicule has no meaning. It does not appear in the Oxford English Dictionary. I discovered this lacuna just now when I typed the term into the OED and was advised that the nearest English word is ‘manicure’. Few of the pointing hands I have seen require such care to their nails (if they have them at all). Bill Sherman similarly noticed in 2005, when entitling an article ‘Toward a History of the Manicule’ that the word – the concept he was championing – had no existence then. Five years on, and despite his work, it is still not recognised. One wonders why this oversight: is it because it is rude to point? Is there a worry about touching the manicule because you don’t know where it’s been? My immediate reaction was to call for a campaign, demonstrations with appropriately designed placards demanding dictionary space for the manicule — a truly Pythonesque occasion. But then it struck me that there is something of a badge of honour in being so underground that you have no meaning, something ironic that an image so well-defined can have no definition, and something fitting that a symbol from the margins is considered so marginal. The manicule is precisely beyond the text and, indeed, defines the text rather than being defined by it. So, what has the OED to offer to an extended forefinger that has travelled so widely? If a manicule was to appear, it should not dragooned into line alongside any quotidian term. Frankly, the manicule has no need of the OED. So, rather than campaigning to include it, let’s fight to keep it out of the dictionary. Anyone to join me? Put your manicule up. London: British Library, MS. Harl. 1705, fol. 41v. I must admit it had not occurred to me until my wife mentioned it yesterday that this October sees the 620th anniversary of the birth of Humfrey, duke of Gloucester. In my defence, the six centuries and one score years is not necessarily the most memorable occasion which requires celebrating but this autumn does see the Duke having his own little local renaissance. the birth of Humfrey, Duke of Gloucester, whose generous donation in the mid-15th century of a large collection of classical manuscripts transformed the original University Library established by Thomas Cobham, Bishop of Worcester, and led to the construction of the beautiful reading room now known as Duke Humfrey’s Library. My eye was caught by the description of his ‘donation’ — in fact, at least four donations, with the two most significant being in 1439 and 1444, and with a total of about 300 books being given to the University. The range of manuscripts included biblical commentaries, some scholastic texts, some legal works, a notable assortment of medical texts, some classical works, a few of them rare, and a smattering of new humanist writings. It is interesting to see, in Oxford, his gifts remembered for being a ‘collection of classical manuscripts’ — a partial recollection of the collection that perhaps says more about our generation’s interests than about his eclectic library. Humfrey is most celebrated for his patronage of humanists like Pier Candido Decembrio (though he claimed not to have received his dues from him) and Tito Livio Frulovisi, biographer of Henry V (though Tito Livio soon left the duke’s employ). It was via the Milanese Decembrio that Humfrey gained most of the rare classical works in his collection — refound texts like the Panegyrici latini. This, though, is in danger of overlooking the range of activities going on at his court around the duke, if not always with his close involvement. Then again, I can hardly complain about a concentration of interest in his ‘classical manuscripts’ — my own work, I suppose, is stoking that tradition. I must remember to make amends.